Adding the English en-GB language pack to Windows 10 1607 as part of an MDT build and capture can cause the indexing service not to work depending on how its being added. See here for the specific scenario. You will note that I have commented on this forum post as I have been working over the past 2 weeks to resolve the issue. To avoid this indexing issue the language pack needs to be added to the original 1607 media that Microsoft released last July 2016. Do not use the CBB media that was released in November 2016. The install.wim has been serviced and any language packs that are added will either fail or cause problems with the reference image when its deployed. The language pack must be added before a Cumulative Update is installed for the first time. And here is essentially where the problem lies – applying a CU during a build and capture and then applying a language pack at a later date is the root cause of the indexing issue. During my testing I’ve found that injecting the language pack and feature on demand components offline using DISM is the easiest way to accomplish this task. See this MSDN documentation for the relevant commands on how to mount the install.wim file, inject the cabinet files and then commit and unmount the wim. The order in which you add these is important. Once you have your modified install.wim file you can import this into MDT as an Operating System for your build and capture task sequence. So its pretty important to apply the most current CU available to Windows 10 1607, there are a ton of fixes, we know this. However there was a bug in the WU agent with the original 1607 media which prevented it from contacting a WSUS instance. As a workaround to this I’ve added a step in my MDT task sequence which uses WUSA to install the latest CU and then restart the OS. This occurs prior to the Windows Update patching step that I have in my task sequence. I now have a Windows 10 Enterprise 1607 install.wim with the language pack and feature on demand components added. I’ve completed an MDT build and capture and I have my patched reference image which I’ve added into Configuration Manager CBB. The last step we need to look at is making a small adjustment to the unattend.xml file that it being used when the reference image is deployed. Because we now have English US and English GB in the wim file, we need to tell Windows 10 which language to use during the out of box experience phase (OOBE) so we don’t see a prompt asking us which language we would prefer. Pretty simple – make the following changes to the Language value so it is changed to en-GB. That’s it! Deploy the new reference image and after a domain user logs in verify that you have the English (Australia) language pack installed and most importantly that the indexing service has correctly indexed the control panel and other items that normally would have failed. I’ve kept my original blog below for reference only – please note that it is now inaccurate and shouldn’t be followed. Something that used to be quite simple, is now not so simple. 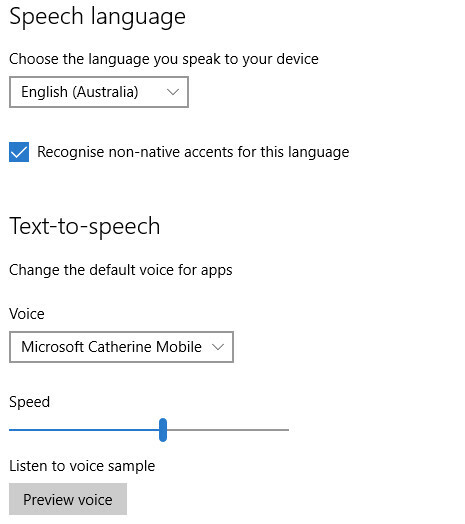 With the advent of Cortana, the English (Australia) Language pack is now no longer included in the base Windows 10 ISO. This does make some sense given the large number of languages that Windows 10 now supports with Cortana in mind. You end up with Australia as your region but with English (US) as your default display language. You also do not have English (Australia) as your Speech Language with no Australian Text-to-speech voice options. In order to fix this we need to add a Language Pack as well as some additional cabinet files from the relevant Windows 10 Features on Demand ISO available though VLSC. To be clear – if your deploying Windows 10 1607 x64 Enterprise – you will need to download the Windows 10 1607 x64 Enterprise Language Pack ISO and the Windows 10 Features on Demand ISO as there are individual ISO’s per Windows 10 release. You will notice that there is no en-AU language pack cab file. This is because the English (Australia) display language is a part of the en-GB cab file. There are specific en-AU Text-to-speech and Speech cab files though which should be added for Cortana functionality. Copy the following cab file from the extracted Windows 10 Language Pack ISO to a source folder on your ConfigMgr source packages share. Once the deployment is finished, logon and open the Settings App. 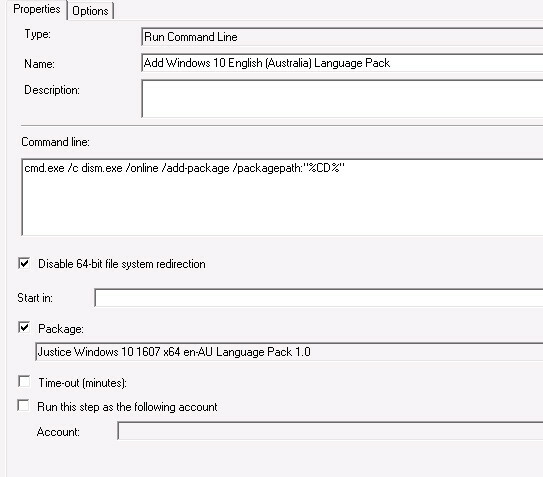 Open Time & Language and you should see under Region & language that English (Australia) is present with “Language Pack Installed”. If you open the Speech option, you should see English (Australia) as the spoken language. Thanks for this. Just updated my TS today with your recommendations, once I work out why it’s blue screening on login I will be happy to have this going out to our test group! wow, its not the language pack stuff thats causing it is it? Ended up taking a month to figure out but it was our Antivirus! Hi Damon, any advice for applying the language packs when using the new OS upgrade task sequence (in-place upgrade) introduced with SCCM 1602? I haven’t needed to do this yet however it stands to reason that you could add a TS step at the end of your ConfigMgr OS Upgrade TS to add the language pack. Your workaround works to add the Language packs but I am unable to get the TS set the AU as default. I get prompted to select a language during my image deployment. However if I pass en-US for all variable in my unattend.xml, I do not get prompted to select the language, but the default language is set to United States once the image finishes deploying. Anything I may be missing??? Is there an additional step? Open it up using System Image Manager and check that you have the wow64_Microsoft-Windows-International-Core_neutral catalog option added to the specialize pass. You should have the InputLocal set to 0c09:00000409, SystemLocale set to en-AU, UILanguage set to en-AU, UILanguageFallback set to en-US and UserLocale set to en-AU. Also make sure that the wow64_Microsoft-Windows-Internal-Core_neutral catalog option is added to the oobeSystem pass – same values as per the specialize pass. Not sure what I am missing here. Could it be my reference image, I recall setting the region to Australia and installing language packs on it. Does your method work on a vanilla reference image that does not have language pack downloaded and installed on it?? PS: I am going to create another reference image, this time without downloading the language packs on it. BTW I am trying this for Windows 10 1607. Sorry but I’m not using variables to set my language settings so I can’t really comment on the process that your using. I’ve deployed this solution with Windows 10 1607 successfully without any language packs or region settings added to the reference image (so you could test by using the Microsoft 1607 ISO without any changes) – I would recommend either setting the values specifically in your Unattend.xml that is referenced in your Task Sequence or troubleshooting why your variables are not being honored – perhaps take a look at the Windows installation log files and smsts.log files. I found out the issue I was having with the language packs, (a silly thing that I overlooked). Basically because I had already downloaded the language pack on my reference image, the TS failed to install it again giving an error that the package is not required. I had also forgotten to check the Continue on error for this TS and hence the remainder of the TS did not run. The issue now is that the image does not set to Australia as default and I can see the language packs made available. Thanks for your help mate. The language pack trick was good to know. Just tested the application of Language packs on my reference image (WORKGROUP), and for some reason the language pack does not apply to this. I have injected the TS in the same spot as when I do during the SOE deploy TS. It does not work on the Reference image TS but works on the SOE deploy TS. Strange I think. Tried looking at the SMSTS logs but the step isn’t even listed. I’m having the exact same issue as you and cannot work it out either, not using the variables but injecting the language pack via DISM offline or online as part of the TS doesn’t seem to make any difference. Likewise the latest CU which I was hoping might have had some fix hasn’t helped. I am using the original 1507 ADK still so wondering if perhaps the 1607 ADK might also help. In your previous reply you said “Changed the to en-au and that did the trick…” I think you meant to say “Changed the to en-AU ? can you please elaborate on what you changed to fix it for you. The following settings for Language worked for me. This has worked for me for Windows 10 1607. Changed the “WHAT” to en-AU ? Have you come across this issue with your OSD? I’ve checked that this is the case — if I deploy without en-AU everything is fine. I’ve been banging my head against a wall trying to figure this out. Trying a fresh raw image of the november 1607.1 release to see if there’s anything different right now but this is driving me crazy. I don’t want to remove en-US altogether for reasons stated at the end of the post linked. You have pointed out something that has been reported to me. However I haven’t had the time to investigate the cause. We are in the same position in that we have to have en-AU present. We could look at removing en-US but its anyone’s guess what the fallout from this would be! Having multiple languages in an OS ‘should’ be perfectly acceptable and would be required for a lot of Enterprise’s. Let me do some checking to see if its still a problem for us or not as the last time it was mentioned was last year. I will also check the latest insider build to see if the problem is still present. Verified that I have the same issue. Not sure when its started to occur but I’m pretty positive the issue wasn’t present when I first created my 1607 reference image. Anyway, I’ve manually fixed it by browsing to C:\Users\username\AppData\Local\Packages\windows.immersivecontrolpanel_cw5n1h2txyewy\LocalState Right-clicking the Indexed folder > Properties > Advanced > Check Allow files in this folder to have indexed in addition to file properties. Click Apply and Exit. I then restarted and I could then see that a language folder gets created. I will look at working out a way to push this out as a fix through a GPO this week. I’m glad i’m not going crazy! It only started with 1607 for us. I’ve found that using lpksetup /u en-GB also resolves the issue and doesn’t seem to effect the en-AU regional and language settings at all. I am going to try adding this is a step in the task sequence but ideally I guess it would be best to get en-AU installed without en-GB bundling itself in. Hi KW, I now have modified by blog with a proper fix for this issue. Initial testing for my environment shows that triggering a rebuild of the index file “Windows.edb” located at C:\ProgramData\Microsoft\Search\Data\Applications\Windows, then performing a restart, fixes the problem. I’m going to do some testing this week to see if I can script the trigger for rebuilding the index file into my OSD Task Sequence. It would appear that the OS isn’t handling the introduction of an additional language pack during OSD anymore in that this index file is corrupted. Ran your updated method injecting the language pack to the original 1607 install.wim, adjusted the unattend.xml as below. I am still getting the two language’s UK and US, at the end of the build and capture. Did you run across this at all? Hi John, yes that’s correct. You will still have the default English (US) language present as well as English (Australia). This is the correct way to manage the scenario as its not possible to remove the default language. However you should have the default display language set to English (Australia) following the deployment of the reference image “with” the indexing working. In the settings app in Windows 10 – you should only see English (Australia) as the display language. English (US) should not be present. Thanks for the reply, I think above someone else had (I get prompted to select a language during my image deployment), I jam getting the same thing being prompted to select a language, there might be something missing with my unattend.xml? Have followed your new suggestions above with no luck. I’m unable to post an image and or code with xml tags in the comments section. If your still having issues let me know and I will post my unattend.xml contents to the blog. Thanks for the reply I will double check the unattend.xml pretty sure I have placed the language settings in both specialize and oobeSystem pass. Could I possibly if I post my xml to you to double check it? There is nothing to crazy in it. Its super stupid now. To see the language packs for 1607 you need to select multilanguage in the language type. Ah thanks so much indeed the multilanguage part was the stumbling block. for bare metal builds using Configuration Manager, we are setting this using an appropriately configured unattend.xml file. Great Post, one thing I am yet to try is with the EN-GB windows 10 media, I see they have one updated as of Jan 17. Do you think the act of the image being pre-serviced from Microsoft to load in the CU patches will break importing just the EN-AU components during deployment? I have tested with the en-GB Windows 10 Media and can confirm that it looks good. No need to import the en-AU Components either. They are included. FYI, the reason I had tone this was due to Spell Check not working with the en-US Media in Internet Explorer. You’re a life saver, thank you! Could you please help me out, how can i fix this issue? Those settings have a small error the first line should be 0c09:00000409 in addition to that do you have a step in your Task Sequence that is installing the language pack files?